In order not to overload this page with photos, I will give you many LINKs to my detailed pages. Take your time to explore them at your leisure. In former times, this place was called Takata (Takada no Shoo 高田の庄). In 1679, the feudal lord of Mori 森 lost this domain and in 1764 it was given to the lord of Miura 三浦, who coined the new name of Katsuyama. 三浦氏2万3千石の勝山藩. Remains of the domain castle of the lord of Miura remain on the North Mountain. It is located at the banks in a huge curve of the river Asahi, Asahigawa 旭川. The little harbor with its stone street and iron rings for fastening the reigns of horses remains. From this harbour called Gangi がんぎ the small boats Takasaebune 高 瀬舟 would go down to Okayama. They carried goods brought over the Izumo road to here, namely ironware, coal, tobacco and cotton and brought back salt, Japanese paper and oil. The river must have had much more water in former times. Now it looks rather thin for such a trafick. Click on the haiku to see more of my photos of the boats and landing place place. Click HERE for some more WWW photos ! 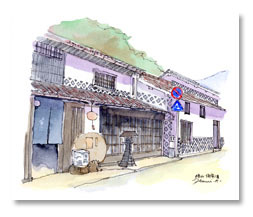 Katsuyama is a small town in Okayama prefecture, its total area is 138.79 km². It belongs now to the Maniwa 真庭市 district. 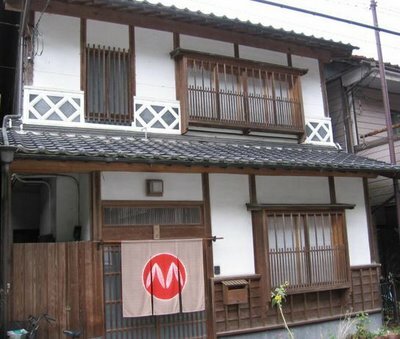 There are still about 93 homes in the old tradition of the old samurai and merchant style. Many stores hang the typical store curtains (noren) in front of their entrance. The Sake Brewery "Gozenshuu 御前酒" is famous and its storage hall is presently used for art exhibitions. 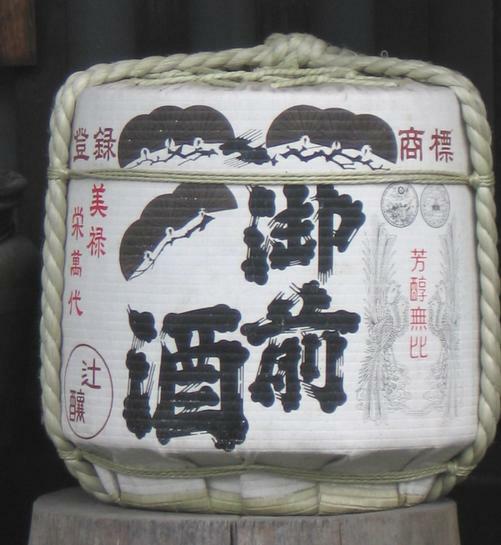 The water of Katsuyama is very clean, there is a well used by this brewery and the God of Water is worshipped. Click HERE for some WWW photos ! Click on the Haiku to look at it ! The townspeople are proud to be there and work for the preservance of the old town. Each year around March 3 they show their antique dolls for the Doll Festival (hinamatsuri　ひな祭り) . In October they celebrate another festival with a noisy fighting parade, Kenka Danjiri　喧嘩だんじり. 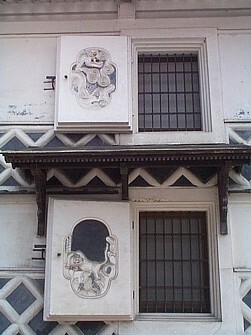 There are many old merchant houses in town. Click on this photo to see some more of my collection! Photos from #11 to # 17. This temple was founded by the Lord of Miura and is now in honor of Genkoo 元光寂室. 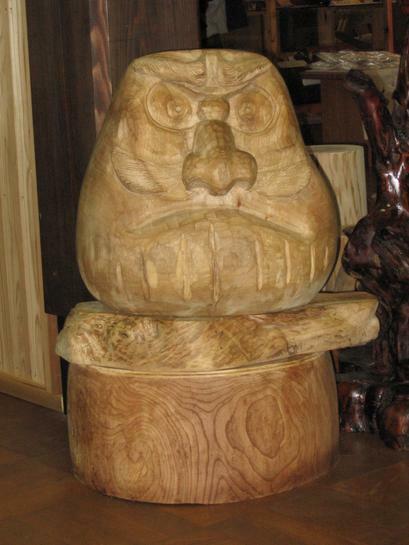 The main statue is a Kannon, which is an important cultural property of Okayama prefecture. The official residence of the Watanabe family. Look at the lovely garden scenes too. The wet leaves of this day were beautiful ! The old tree in the compound, Sooshi no matsu, is now more than 300 years old. Photos from #56 to # 62. The main statue here is of Amida Nyorai. On the outside, there is a remarkable relief of woodcarving. Photos from #63 to # 71. This temple is from the Nichiren Sect. In the back is the Banjin-Do 万神堂, a hall for all deities. With an exquisite wooden board of bonsai paintings. The first time I saw these outside of a building. Photos from #86 to # 91. Click on the photo to see my details. Photos from #92 to #93. Click on the haiku to see more of my photos of the shrine in honor of the deity Okuninushi of Izumo 大国主命の社. Click on the photo to see my details of these marvelous door decorations ! Look at my details about the Stone Memorial HERE ! Look at my details about the trees of Katsuyama ! Look at my details about the Inari Fox Eyes ! 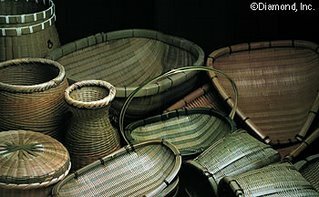 Katsuyama bamboo basketry started at the beginning of the 19th century but became an established area of production at the end of the Edo Period (1600-1868), when baskets known as harisouke were made. These are thought to be associated with souke and meshizouke baskets that are still being made today and form the main bulk of production, which maintains the standards of a practical craft product throughout. The baskets are simple with an undeniable presence and have a reputation for their durability and being easy to use. 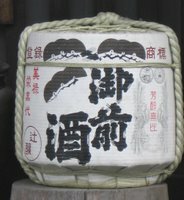 Given its unique qualities, bamboo has many practical uses and can be utilized to make many, many items to be used in the home, either in a Japanese or western setting. In addition to the more traditional baskets, there are some for bread, decoration, and for flowers. There are now 22 firms employing 28 employees. Located to the north of Katsuyama town, in the Okayama Prefectural Natural Park, this waterfall is ranked among the 100 Most Beautiful Waterfalls of Japan. It is also the largest waterfall in the Chugoku region, with a height of 110 meters and width of 20 meters and a spectacular volume of water cascading over the long single drop. From the fresh green of spring to the bright foliage of autumn, the seasonal scenery in the gorge can be enjoyed throughout the year. The park also has the Tamadare Falls, which has a mysterious and romantic ambience. Japanese only, but the photos are delicious !